CAMEROON IS A triangle-shaped nation slightly larger than CALIFORNIA. It is wedged between NIGERIA and EQUATORIAL GUINEA on Africa’s west-central Atlantic coast at the Bight of Biafra. The country has varied terrain with western mountains, northern grasslands, and tropical lowlands in the south. Forests line the Atlantic coast. Grassy savannas stretch northeast to marshes on Lake CHAD. To the east is the CENTRAL AFRICAN REPUBLIC. To the south are GABON and CONGO. Tourism is limited, but recreational areas include beaches near Kribi and abundant wildlife within the national parks, particularly herds of elephants protected in Waza National Park. Archaeologists’ findings of stone tools and rock carvings indicate that prehistoric peoples preceded the Bantu speakers who first came to the northern highlands about 2,000 years ago. A state called Kanem existed during the 8th century and included parts of present-day Cameroon. Today, the population includes pygmy tribes and 200 different ethnic groups from 24 different language groups and 80 distinct dialects. The largest tribes are Bamileke (30 percent) and Fulani (7 percent). The predominant religions are animist (51 percent), Christianity (33 percent), and Islam (16 percent). The country’s name comes from the Portuguese word for shrimp after European explorers in the 1400s who found small crayfish that looked like shrimp in the Wouri River. Slave trading flourished from the 15th century well into the mid-1800s; thousands died fighting slave raiders or suffering from cruel conditions en route to the Western and Arabic worlds, where they were forced into unpaid labor and considered owned property. In 1858, British missionaries established the first permanent European settlement in Cameroon, the town of Victoria at the base of Mount Cameroon. The UNITED KINGDOM, FRANCE, and GERMANY struggled for control during the 1800s, then in 1884 two tribal chiefs signed a treaty that made Cameroon a German protectorate until 1916. Under terms of the World War I Armistice, France and Britain divided the territory and later received League of Nations mandates, then United Nations trusteeships. Both pledged in 1946 to grant self-governance. French Cameroun became independent on January 1, 1960. In February 1961, British Cameroons voters in the north chose to merge with Nigeria, while voters in the south chose Cameroon. 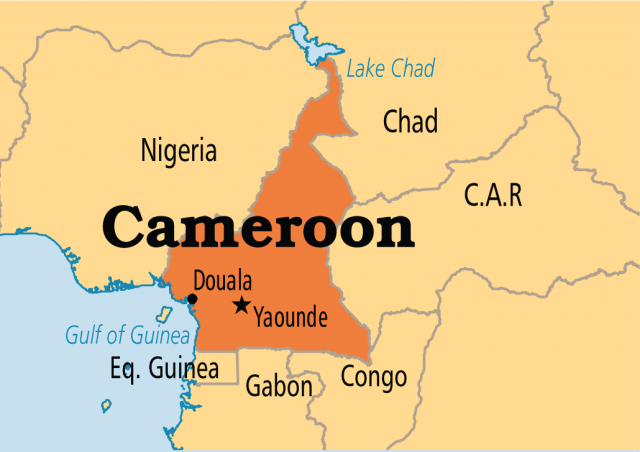 Cameroon is divided into 10 provinces, each headed by a governor appointed by the president, who as head of state holds the most governmental power and is elected to a seven-year term. In the National Assembly, 180 legislators are elected to five-year terms. Cameroon’s chief political party is the Cameroon People’s Democratic Movement and was the only party allowed until 1991. Coffee, cocoa, cotton, rubber, bananas, livestock, and timber are Cameroon’s major products, but petroleum is the primary export.